As part of American Heart Association’s (AHA) Go Red for Women campaign, the Hall of Languages, Hendricks Chapel and the Nancy Cantor Warehouse will be illuminated by red lights from Thursday, Jan. 31, to Sunday, Feb. 3. Today, AHA’s Go Red For Women campaign will be celebrated across the country, coinciding with National Wear Red Day. 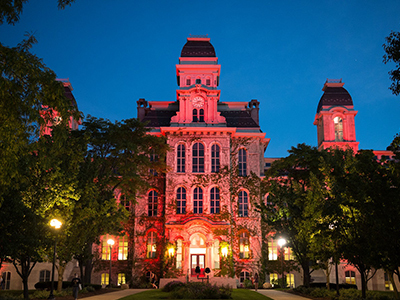 Everyone across the country, including Syracuse University community members, are encouraged to wear red. The Go Red for Women campaign found its roots after a 2003 landmark study revealed that heart disease was the number one killer of women. The campaign, which attempts to raise awareness of this serious issue, has made the red dress an iconic symbol of the battles against heart disease in women. Bea González, vice president for community engagement and special assistant to the Chancellor, is chairing the Syracuse AHA Go Red for Women campaign. In this role, González continues the work of the previous years to educate and bring awareness to heart health to the Syracuse community, with a focus on women of all ages. The group that is working with González on the campaign is representative of the Syracuse community; its deliberate inclusivity and diversity is a strength that González credits for its success as the ninth most active and productive Go Red for Women Circle of Red in the country. An annual event, National Wear Red Day, falls on the first of February this year and brings attention to cardiovascular disease in women by encouraging everyone to wear red and take positive action to live longer, healthier lives. To learn more about wellness offerings and opportunities, please visit wellness.syr.edu.